We hope you all had a Merry Christmas! Did you get what you wished for? The New Year is right around the corner! Anyways, the topic of the day is: Karate. Karate is said to have originated over 1000 years ago in China as a martial art form practiced by monks. Due to large amounts of trading between China and Okinawa the martial art form soon became an arts studied by Japan. 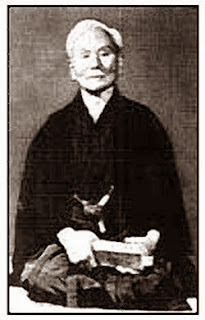 "Master Gichin Funakoshi formally introduced a style of Okinawan fighting arts, known as Okinawa-Te (later known as Karate) to mainland Japan in 1917 where the art of Karate soon became popular. Master Hidetaka Nishiyama in his book KARATE THE ART OF EMPTY HAND FIGHTING claims, "At the same time, the ancient native Japanese hand-to-hand fighting techniques jujitsu and kendo (sword fighting) were being widely practiced, and modern sports imported from the West were rapidly becoming popular. Karate soon took over many elements of both of these, and the basis was laid for the modern Japanese-style karate".- Karate History. If you have any questions or would like to help us out please feel free to comment. Master Ginchin Funakoshi is in the photo above. "Karate is not only the acquisition of certain defensive skills, but also the mastering of the art of being a good and honest member of society." - Ginchi Funakoshi. Thank you for stopping in! Happy Holidays! We hope you are all having a great week! Is anyone doing any last minute Christmas shopping? If you looking for a last minute gift our Samurai Sword Sets are 40% off this week in store only promo: bktw12. Hurry on in they are going quickly! Now for the product of the day: The infamous Sai aka Kobudo used by Raphael (ninja turtles) and Elektra. After doing some research we found that the Sai originated as early as the 1400's in China as a farming tool. Some sources we found say the Sai was used by the police in Japan as batons. The origin of the Sia seems to vary between the different forms of martial arts. Does anyone have any insight? 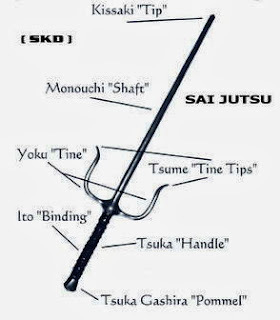 Here are some of the forms that use the Sai: Kajukenbo, Karate, Tae Kwon Doe, Ninjitsu, Jui Jitsu, and much more. Have you taken an interest in swordsmanship but do not know where to start or base your training off of? Maybe we can help! 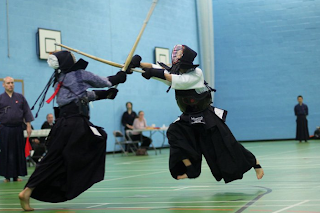 Here's a link of the history to traditional form of japanese swordsmanship called Kendo: Kendo History. There are millions of people practicing this art form and they love it. 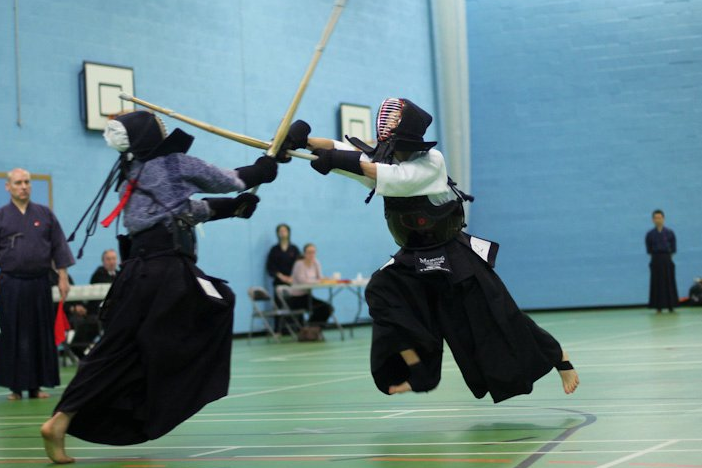 These are some of the schools taught here on the island Hawaii Kendo Dojo's and for alittle inspiration to get yourself started we have a video of some Kendo in action: Kendo Championships. If you have any questions about this or any other form of martial arts please feel free to contact us. Thanks for dropping in! Has anyone encountered a runner with a gas mask on? We have and it was pretty weird. So we did some research on "gas mask" training. 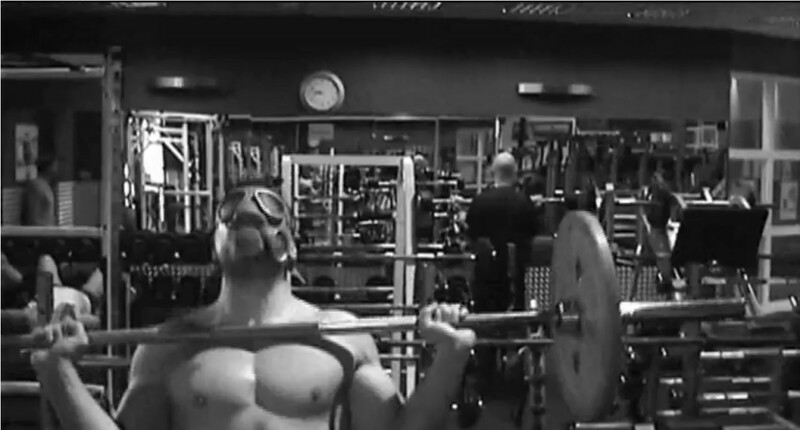 Training with a gas mask is equal to training in high altitudes; better breathing with less air. 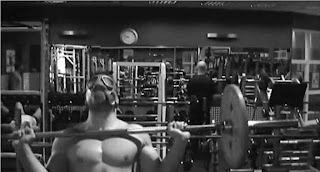 Here is a link to a further and more in depth explanation and a video on how they train: Gas Mask Training. The product of the day is our Dipped Foam Headgear. Safety first! The Dipped Foam Headgear is 2cm thick, provides outlets for the ears, and secures on with an elastic strap. If you are looking for a headgear that provides maximum visibility this product is right for you. 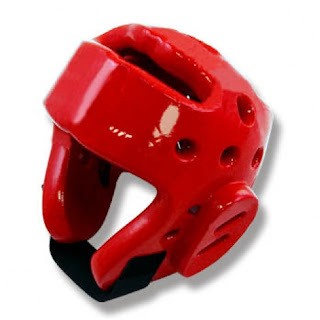 We also sell face shields that attach to these helmets for added face protection. Our dipped foam headgear is also tournament certified! Do any of you use our headgear? If you have any questions please feel free to contact us at: info@kcmartialartssupplies.com. Have a great day! We hope you are having a great week! 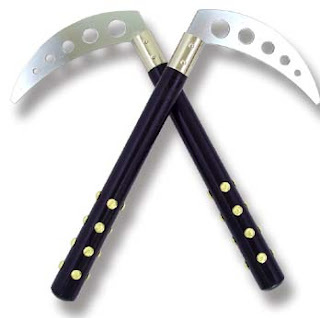 Today's featured product is the Kama (Sickle). The Kama originated in the 1600's traditionally used by the Okinawan s as farming tools which later became there weapon of choice. Here is the link: Kama History . If anyone else has any more information about the Kama please feel free to comment. How long does it take to master the Kama? Have a good day! "I am to old for martial arts." It is officially Christmas month! Happy Holidays! Here is the good news: "It is never to late to join martial arts!" There is a martial art for every age. 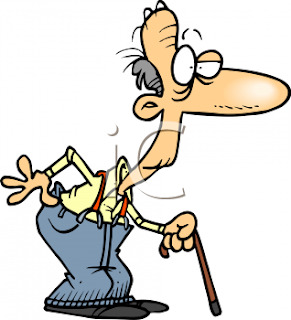 Have you ever asked yourself how old grand masters are? Old but they can still move. A more popular martial arts amongst the "elderly" age is Tai Chi. Tai chi is very peaceful, relaxing, and gentle. It is even said that Tai Chi helps prevent cancer and other diseases. Here is a video to help you get started and if these people can do it so can you!